Even those with only a passing interest in horse racing will have heard of Frankie Dettori MBE. He's considered by many to be a true legend of horse racing with a career spanning across decades. Born on 15th December, 1970, the Italian jockey has set a standard for others that is far from easy to follow. 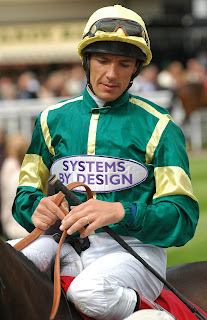 A consummate professional and entertaining personality, Dettori has been the Champion Jockey on three separate occasions and has ammassed several hundred Group Race wins. It's hard to do justice to Frankie Dettori by reeling off a simple summary of achievements, primarily because it's a very long list! But in brief, with countless wins across a stellar career, some of his major wins include the 1,000 Guineas three times, the 2,000 Guineas twice and the Ascot Gold Cup an incredible five times. Add in a Derby win in 2007, and it’s very easy to see why Dettori is so revered and respected across the board. He's won races in over 20 different countries and on 12th August 2016 had his staggering 3000th British winner, one of only 6 jockeys to do so on the flat. An incredible competitor, he appears to have a natural feel for the horseS he's riding and the field around him. He doesn't often put a foot wrong. Although Dettori has had his fair share of personal problems over the years, including a substance-related ban in 2012, he more than bounced back to be crowned the World’s Best Jockey in 2015. This very much speak to his character, as a determined and successful sportsman, refusing to let problems knock him off course for long. Earnings – £14 million career earnings. I am very happy to learn of Dettori and glad to know Toast Of New York will have a great jockey to help him win the Pegasus World cup.